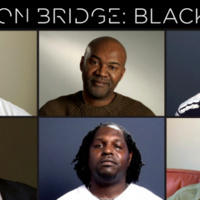 Question Bridge: Black Males is an innovative, widely-exhibited multimedia project by artists Chris Johnson and Hank Willis Thomas in collaboration with Bayeté Ross Smith and Kamal Sinclair. Question Bridge is a five-screen video installation of conversations amongst over 150 men from twelve cities across the United States in which the participants ask each other questions about their shared experiences as Black men. Question Bridge is presented by the Mary Porter Sesnon Art Gallery with the support of the Institute of the Arts and Sciences, February 6- April 6, 2019.